Don Smith (California, United States) on 30 July 2008 in Landscape & Rural. 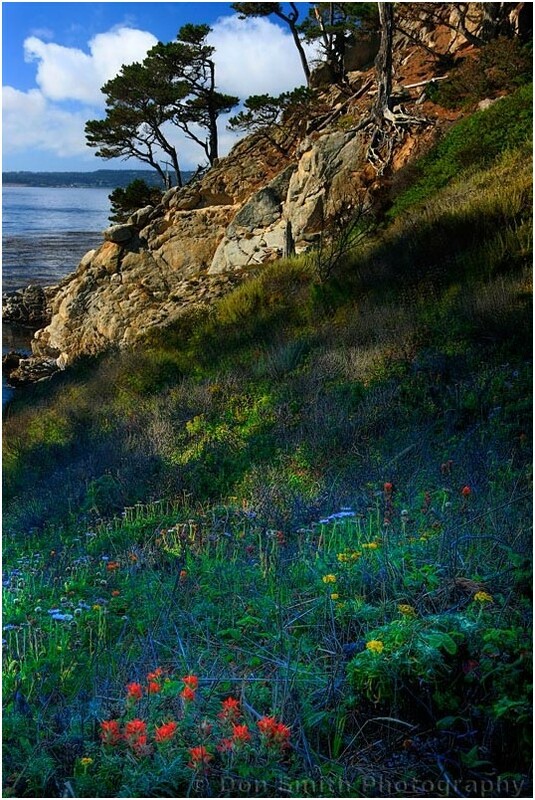 Summer wildflowers and Monterey Cypress trees grow in the moist environment of Point Lobos State Reserve along the Monterey Bay, California. This image was an HDR combination of 6 images combined with Photomatix Pro 3.0. I then replaced the sky using a single sky image and a mask in Photoshop CS3. Because of the movement in the clouds between the bracketed exposures, Photomatix could not register them as a convincing match. Finally, I optimized the foreground flowers using Nik Viveza. This image was captured in late afternoon light. A single frame exposed for the highlights would have produced blocked-up shadows. Conversely, a single frame exposed for the shadows would have produced blown-out highlights. HDR allows the image to reproduce as the eye would see it. If you are interested in purchasing a copy of Photomatix Pro, please use my promotional code at checkout donsmithphotography to receive 15% off your purchase. To learn more about these and other image optimizing techniques, please visit my website at Don Smith Photography.com and click on the Writings/Articles tab. Stunning photo ,the wildflowers are so colorful and strewn delightfully over the slope. he balance is great your eye is lead from the bottom right to the top left, very,very nice. It's a glorious nature composition. WowowoWonderful HDR job !!! really S T U N N I N G beautiful image ! One of my favorite places and you've represented it spectacularly! Thanks everyone. HDR is really fun - it's opened up a whole new world of possibilitites for me! simply gorgeous! i love everything about this pic -- perfect composition, light, balance and color! and the small bunch of red flowers in the left forefront are just stunning! Thanks guys - I always look forward to hearing from both of you!